Library guide to resources to make your StagUp Startup submission the best it can be. 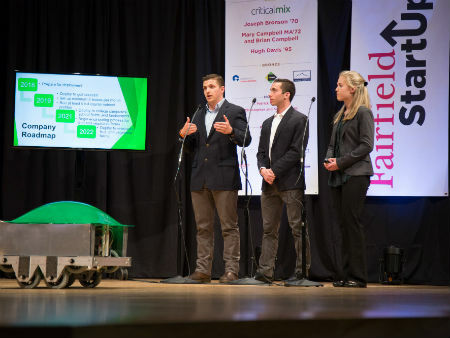 Pictured above: Team Land Maverick, pitches a robotic rover designed to automate the process of soil sampling for faster and more accurate results. Of all the StartUp teams in 2018, Land Maverick received the most seed money: $8,500, plus $10,000 in investor pledges. See the Business Model Canvas. Learn more about the Dolan School of Business- StagUp Startup Competition, including rules and important dates. The Startup Showcase website offers a business plan template outline covering the essential content and organization. 1. Opportunity and Market Analysis - For Library Resources, go to the Marketing tab on the left. What is the problem or need being solved by the venture? Who is the customer or customer segment(s)? How large is the potential market, and how much is it growing? What factors affect the buying behavior of the customers in this market? What products/services are in demand in the market? 2. Industry and Business Environment - For Library Resources, go to the Finance tab on the left. Who are your main/potential competitors? What does the competition do? What is the basis of competition (price, quality etc.)? How are you differentiated from them? What is unique about your product/service? How easy is it to enter the industry? What strategies can be used to mitigate competitive threats? 3. The Solution and Concept - For Library Resources, go to the Marketing tab on the left. Describe a “day-in-the life” of the customer before and after adoption of the solution. What is the value proposition to a customer, and why is it compelling for the customer? Which customers have validated the product and are willing to pay for it? What is unique and defendable about the business? What is the appropriate price point? How attractive are the financial margins? 4. Marketing, Promotion, and Sales - For Library Resources, go to the Marketing tab on the left. What are the most appropriate marketing mediums to reach the customer segment(s) and promote the product/service ? Who is the customer decision maker with purchasing power, and who influences that person to buy? What is the most appropriate type of sales channel for the product (e.g. direct vs.indirect sales)? What are the sales targets (forecast three years). 5. Product Development and Operations - For Library Resources, go to the Engineering tab on the left (includes patent searching advice). What is the current state of the development of the product(s)? What resources will be required to finish and ship the product? Be specific about what types of resources will be required (e.g. engineering, tools, suppliers, materials, partners, and customer involvement). What are the planned development timelines and key milestones targeted? What are the key risks that will be mitigated at each milestone? Do any patents, trade secrets, or other defendable advantages exist? Are there any regulatory hurdles that must be cleared? To see examples of business plans, go to the Management tab on the left (Small Business Resource Center). To find domestic and international economic statistics, go to the Economics Statistics tab on the left. The Startup Owner's Manual incorporates 10 years of learning and best practices that have swept the startup world. It incorporates the Business Model Canvas as the organizing principle for startup hypotheses, provides separate paths and advice for web/mobile products versus physical products, offers a wealth of detailed instruction on how to get, keep, and grow customers recognizing the different techniques for web and physical channels and teaches a "new math" for startups: "metrics that matter for fueling growth." The Startup Owner's Manual is a step-by-step, near-encyclopedic reference manual or "how to" for building a successful, scalable startup.